The set consists of a necklace with a centerpiece of fabricated 1oK rose gold, set with a banded agate cameo and freshwater pearls. The center setting is basically a box fabricated by hand from sheet gold. The front is lavishly decorated with hand engraving and taille de epergne enameling. Taille de epergne is a variation of champleve enameling where opaque enamels– usually black– are fired into engraved lines forming a design. This necklace is especially nice compared to others we have seen because of unusual shape, the added leaves and natural pearls, and of course, the tassel. Overall condition is very good, considering the set is ~150 years old! The earrings feature matching agate cameos, beautifully made with hand engraving and taille de epergne engraving. 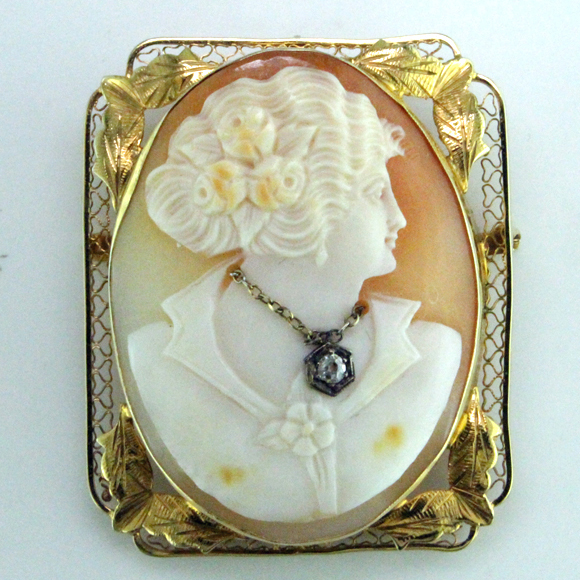 One cameo facing left, the other faced right so they both face forward when worn. 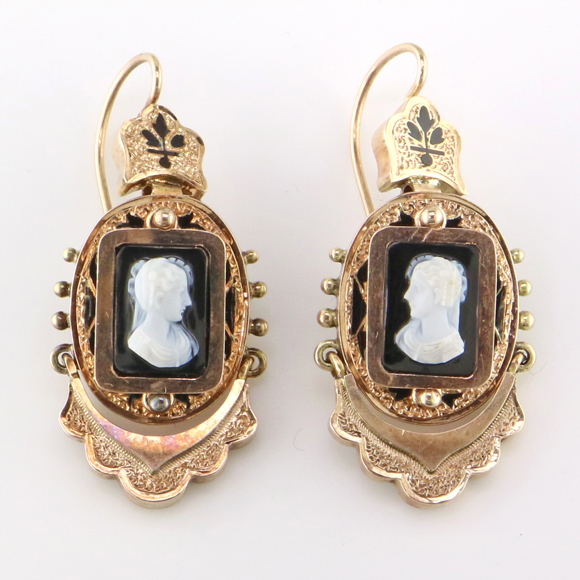 The earrings are nicely articulated- the middle section is hinged the top where the earwires attach and the little engraved “skirts” below the cameo are also jointed. 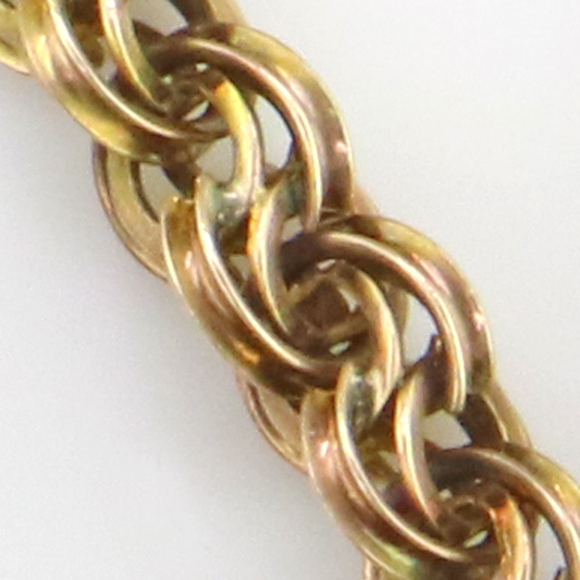 The interesting 17 inch chain is completely handmade of 5 mm anticlastic (having opposite curvatures at a given point) wire rings, assembled into units and soldered. 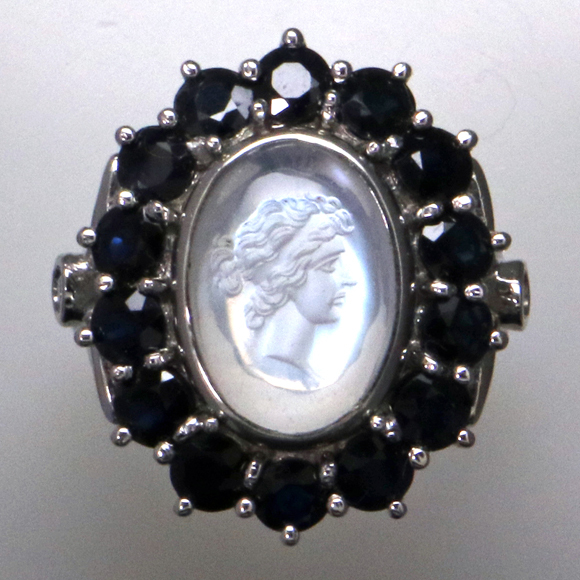 Cameos and intaglios were very popular in the 1800’s. Cameos have the carved figure raised above a level surface, usually of a contrasting color, while intaglios are carved down into the surface, opposite that of a cameo. Kind of like navels– inny or outy! 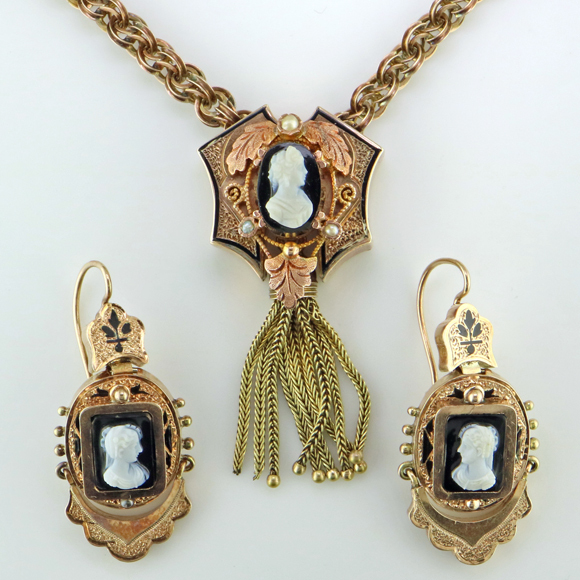 Sold as a set only, I-27903, this wonderful antique necklace with matching earrings is now showing in our estate department, Tuesday thru Saturday, 10 -5:30. If you enjoyed this blog, please give us a vote for Best Jeweler in the 2018 Reader’s Choice survey– it’s easy! You can use a mail-in ballot from the daily newspaper of the Riverside Press Enterprise or even even better, vote online at www.pe.com/IEbest. And, you can vote once every day! We hope you’ll help us make it 10 years in a row as Best Jeweler in the Inland Empire. Thanks for your support and your vote! This entry was posted on Friday, May 18th, 2018 at 4:37 pm	and is filed under Estate Jewelry, Gemstones, Jewelry Facts, Jewelry Services. You can follow any responses to this entry through the RSS 2.0 feed. Both comments and pings are currently closed.